Step up to the plate and swing for the fences! Our Grand Slam Batter-Up Challenge is an awesome baseball batting simulator game. It is a lot of fun and just the right amount of challenge to keep everyone interested! The Grand Slam Batter-Up Challenge is super quick to learn and play. 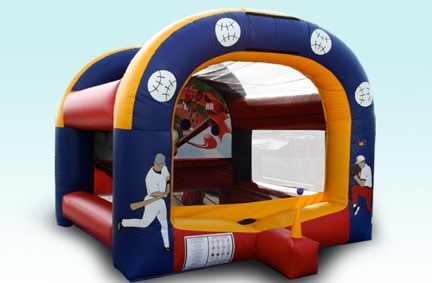 One at a time, each player will hop into the batting area. There they will pick up the foam baseball bat and set one of the balls on top of an air jet. The air jet creates a column of air that will hold the ball up but keep it moving a bit. This makes it a bit harder to hit the ball, but makes it more realistic. The fun really starts as soon as you are ready. The players hit the ball and try to send it through one of the target holes in the back wall. There are a lot of different target holes and each are assigned a point value based on how hard it is to get a ball through that target. The harder it is to hit that target, the more it’s worth.